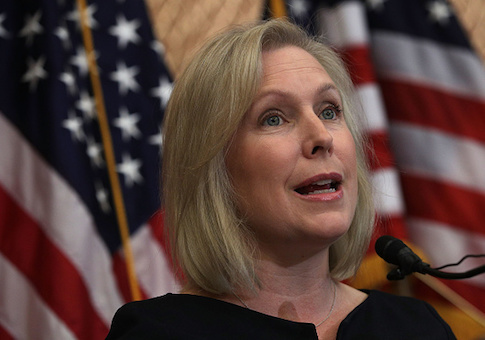 Democratic Sen. Kirsten Gillibrand (N.Y.) said her past comments about eliminating Immigration and Customs Enforcement have been taken out of context. She suggested commentators misconstrued her words by not focusing on her call to replace ICE with a reformed agency. "Give it a new name and a new directive," the New York senator told the editorial board of The Post-Star in an effort to clarify her view. In June, Gillibrand told CNN’s Chris Cuomo she does not think ICE is working as intended. "I believe that it has become a deportation force, and I think you should separate out the criminal justice from the immigration issues, and I think you should reimagine ICE under a new agency with a very different mission, and take those two missions out." She then said the U.S. should "get rid of" and "reimagine" the agency. "And so we believe that we should protect families that need our help, and that is not what ice is doing today, and that’s why I believe you should get rid of it, start over, reimagine it, and build something that actually works," she said.